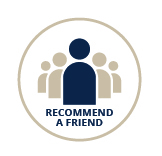 Have you heard about our brand new Recommend A Friend scheme that’s just launched? If you recommend your friend to buy with Mulberry Homes you’ll both receive £500! With rising communities continuing to flourish across our developments, we’re rewarding any residents who recommend their friends to join their new neighbourhood! This means your friends can become good neighbours and you can both enjoy the benefits of owning a brand new Mulberry property together. With a range of incentives and offers available across our exciting Leicestershire and Bedfordshire developments, now is a great time to visit us and find out more about what’s available. When you come to visit the properties at one of our developments, you’ll see the Mulberry Homes mark immediately, with beautifully crafted, traditional exteriors perfectly blended with modern and spacious interiors. Terms and Conditions Apply. This offer is only valid on reservations taken after 1st March 2019. The voucher must be presented upon reservation to be redeemable. Rewards payable upon completion.